*Convenient and unique design, glides effortlessly across any surface. *Ideal for larger and more clear reading of magazines, newspapers, maps and other reading material.With polishing pouch,easy carry for travel. 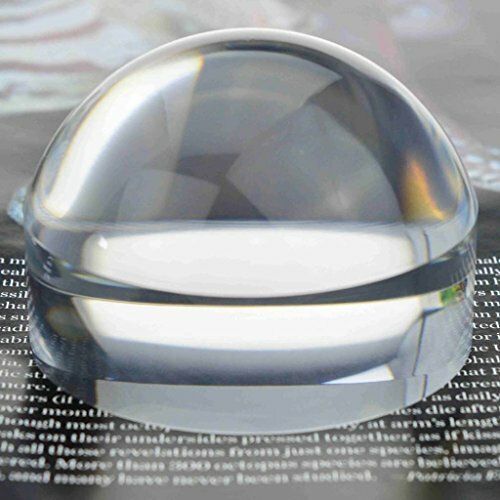 DOME MAGNIFYING PAPERWEIGHT:gather light and double as a magnifying glass. 4X MAGNIFICATION:work with technical drawings and "blueprints". CRYSTAL MAGNIFYING GLASS DOME:great for reading small print on plans. HANDS-FREE MAGNIFIER:convenient and unique design, glides effortlessly across any surface. LIGHTWEIGHT & PORTABLE:ideal for larger and more clear reading of magazines, newspapers, maps and other reading material.With polishing pouch,easy carry for travel. If you have any questions about this product by OANDE, contact us by completing and submitting the form below. If you are looking for a specif part number, please include it with your message.